Harvey McFadden is from Houston, Texas, and has been a life long Elvis fan. While in the Navy, he met Jimmy “Orion” Ellis, a country singer who had a superb Elvis style in his singing. Around this time, Harvey saw his first two Elvis impersonators. These experiences, along with his love of Elvis, inspired him to portray Elvis at a few parties and the response was wonderful. Soon after Harvey retired from the Navy, he went to Tennessee and met Elvis Tribute Artist Lou Vuto, along with Elvis’ long time friend, Charlie Hodge. This was followed by a tour of Sun Studios and his second trip to Graceland. Harvey then ordered his first jumpsuit. He performed several events in 2000, leading to his first paid performance in 2001. Soon, Harvey began making over 50 appearances per year. He added his Country Classics show in 2005; went full time in 2006, leading to 109 performances that year. In 2007, Harvey made 187 appearances. He had 263 appearances in 2008 and in 2009, 310 performances. In 2010, Harvey moved from the Huntsville area to near Abilene, Texas. In 2010, he made 214 appearances and surpassed his 1000th Elvis tribute, as well as his 1,200th career performance. In 2012, Harvey made his first international appearance, performing for the Elvis Fan Club of Singapore, part of 231 performances that year. In 2013, Harvey had his second international performance, in Hanoi, Vietnam. He made 256 appearances in 2013; 283 in 2014; 325 in 2015, 304 in 2016; (And currently at 208 for 2017…at 86 for 2018!) In recent months, Harvey has met several milestones, including his 2,200th Elvis performance; his 2,100th retirement center performance, and his 3000th career performance. Harvey has had his Elvis songs played on Canada’s ETA internet radio numerous times as well as in the U.S. He has also appeared on Houston KHOU TV Ch. 11’s morning show, KPRC Ch. 2 news, Abilene KTXS Ch.12 news, KTAB/KRBC Ch. 32 news, and has been featured in many different newspaper and magazine articles. He has also recorded two gospel CDs (as himself) and has received airplay on KJIC Radio in Houston as well as other Texas stations. Harvey presently has 8 jumpsuits, the 68 leather outfit, the gold lame jacket, movie outfits, and more. He performs all eras of Elvis’ music and gives out scarves during romantic songs. For his country classic concerts, Harvey has several “country performer” outfits as he pays tribute to country legends such as Marty Robbins, Hank Williams, George Jones, Jim Reeves, Conway Twitty, Johnny Cash, Faron Young, and many more. 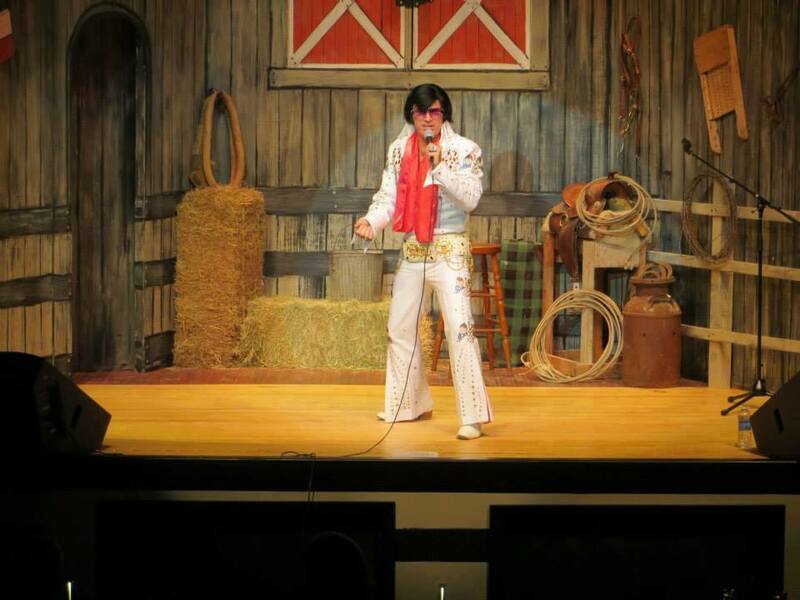 Whether you want his Elvis tribute, his Country Classics show, or a combination of both, Harvey provides exciting entertainment for any venue or occasion. For the longer concerts, his wife, Sharon, provides a country/oldies set that includes the songs of Patsy Cline, Brenda Lee, Connie Francis, and more. Sharon has also a CD available called, “Timeless,” a collection of 10 of her favorite/most requested songs. Harvey and Sharon reside in Hawley, Texas, which is 10 miles north of Abilene. He primarily performs within 150 miles radius of Abilene but has also traveled to Branson, Birmingham, Baton Rouge, Meridian, and many other cities. His primary mission: to touch as many lives as possible with the music and magic of Elvis – to make people smile, and especially, to remember Elvis. Visit Harvey McFadden at his web site and Facebook page.